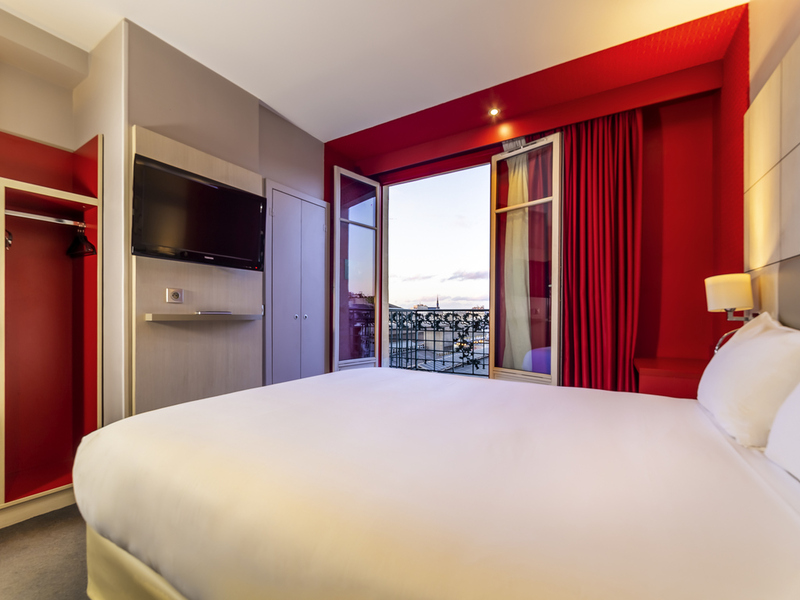 The entire team at the ibis Style Gare du Nord hotel wishes you a warm welcome; take advantage of our ideal location to visit all the main monuments and explore Paris! Breakfast and WIFI are included in all prices at the ibis Styles Paris Gare du Nord. Situated opposite the Gare du Nord train station, 5 minutes from the Gare de l'Est train station and 30 minutes from Charles De Gaulle Airport, the hotel location provides easy access to the main attractions in Paris: department stores, opera house, Louvre, Champs-Elysées, Eiffel Tower, Montmartre, Stade de France stadium, Le Bourget and Disneyland. Hotel ideally located with easy access to the main Parisian attractions and monuments. Location: Gare du Nord, 5 min from Gare de l'Est, 30 min from Charles de Gaulle Airport. Good stay at Ibis Styles. Clean and comfortable room, bathroom small but big enough for needs. Balcony was a nice touch. Man on reception very helpful. Lift to all floors. Directly opposite Gare du Nord station and bus station, so ideal for airport and/or transport within the area. Would stay again. I booked this hotel based on the location only as I was traveling with my family. The hotel is in good location and the hotel staffs found to be very helpful. Family room was not big enough for the kids. The carpet needs to be cleaned/replaced. Shower was good the break fast was ok. My 8 year old boy made the fresh orange juice with the juicer provided which is impossible to get even in four star hotel. If you are on your budget plan, new for Paris and you do not know language-this hotel is good to stay. In, change, out, back, sleep, shower, breakfast, au revoir! I Ready like my time in your hotel, the breakfast is great, the whole staff are nice people with servant mind and heart. Keep doing a good job. Many thanks to the manager Salah for being so helpful in booking this stay. All good apart from the girl who was there for breakfast on the Saturday morning who complained that she had to do more washing up because I took two glasses for orange juice (they are very small and i didn't want to keep having to get up to get more). Dont know why she would complain to a guest about that, its her job and these days she should be lucky to have a job at all, doesn't make me as a guest feel very welcomed. expected a coffee maker in the room, microwave and small utensil. Convenient for 1 night stay, commute and breakfast was good. Staff were helpful and friendly. One double bed was good. Additional bed was not good and couldn't sleep well, so had to sleep on the floor. My stay was pleasant and uneventful. The room was small, but certainly nicer than I would have assumed at this price point. No complaints here. Great location very near Gare du Nord station.Area has a different atmosphere at night- better in day time. Hotel good value for price with included breakfast which included all the essentials. Hotel has a very red colour scheme and narrow lift which we didn't use.Room clean but basic.Unfortunately unable to access any UK news channels. Kettle within room would have been good although one available to make hot drinks in reception area.Cleaning staff very friendly. The staff were friendly and helpful with local information, however the hotel needs updating with the furniture and also breakfast options. There should also be tea making facilities in the room and the TV stations should have options for it's international clients . Friendly reception and breakfast room staff, convenient hotel for Eurostar and metro and bedroom well serviced. Although we met three reception desk staff there was one person who was there most of the time during our visit - Lakhdar. He was so helpful and friendly. Breakfast room was small but provided excellent range of food and drink. Hotel very convenient for Gare du Nord and Gare de l'Est plus metro and bus routes but initially its entrance was not easy to find amongst all the shop/restaurants at street level despite the large green letters with the hotel's name appearing higher up the hotel's frontage. Our room was quite roomy but perhaps could have had more storage/shelf space for a multi-night stay. It would have been nice to have had tea/coffee available in the bedroom rather than have to go to the ground floor to get it; not easy carrying two cups and seeing to lift mechanism to regain bedroom floor but we accept that that is a rare facility in continental hotels.